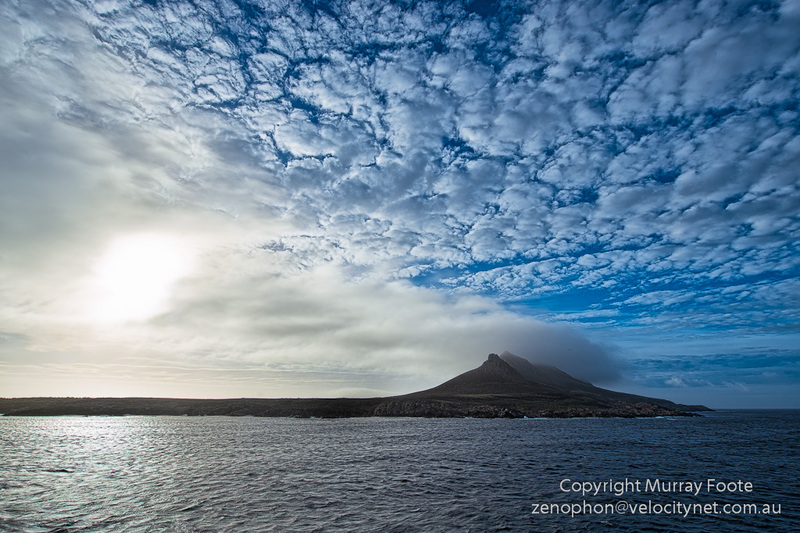 Today was our day to investigate the Jason Islands, a small group of islands at the north-west tip of the Falklands that is seldom visited, partly due to difficulty of landing. We woke up to a fine day with some cloud but that didn’t mean it was calm. 35 knot winds prevented us from landing at our first intended landing place of Grand Jason Island so we proceeded to Steeple Jason Island, the most westerly island in the group. In the afternoon the weather became more calm and we were able to land there. Steeple Jason has the largest colony of black-browed albatrosses in the world, with 187,000 pairs and unusually, the numbers are increasing. 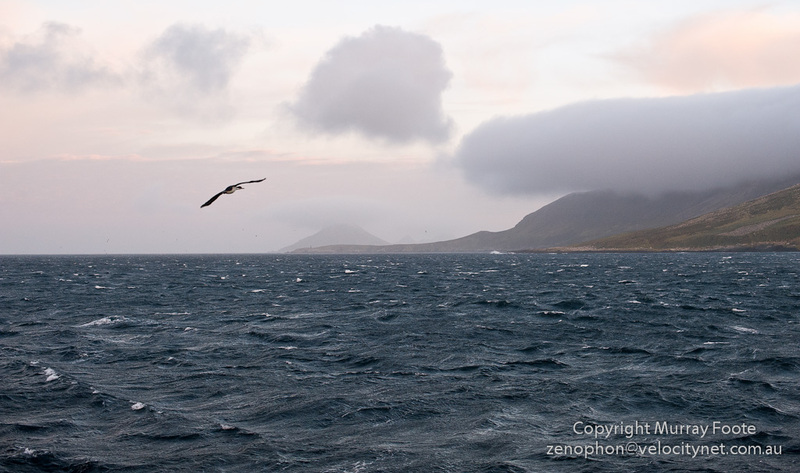 There are many rookeries of albatrosses and penguins on bare rock near the coasts of the island. 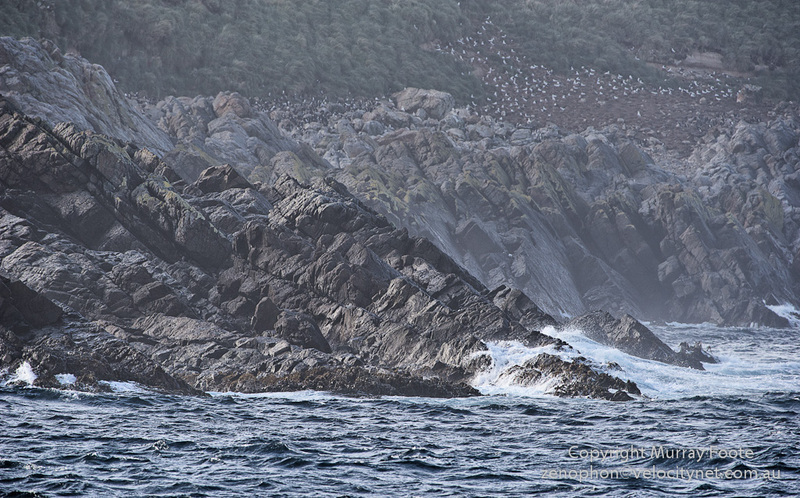 This is a closer view of one, lower mid island in the previous image, mainly penguins in this case with a few albatrosses. Click on the image for more detail. The horizontal panorama above does not fit any larger on this page. There are very many birds in the air over the point, including a giant petrel trailing its wing in the water, and huge numbers of birds beyond the rocks on shore. The vertical panorama at the right could fit larger on the page but would take up too much space. To see either of them “properly”, click on them and a window will open with much more detail that you can zoom in and out of and scroll around in. In that new window, first click the lower right icon for a full window, then use the mouse wheel or other icons to zoom in and out. It’s also better to back off a little from the full resolution that you can get in these screens. 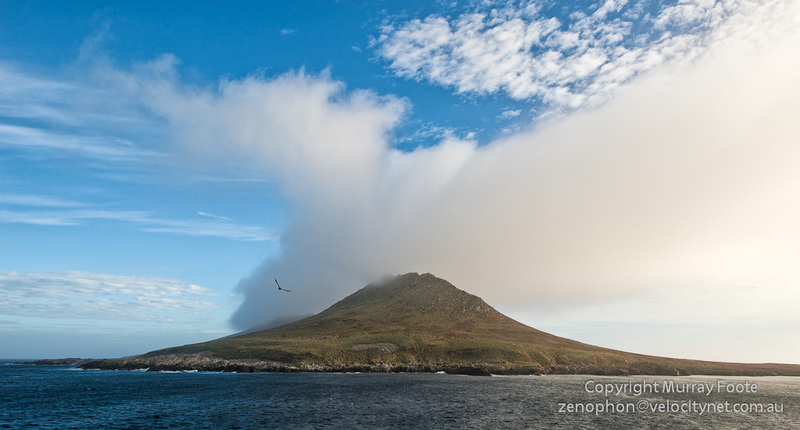 This entry was posted in Falkland Is, Steeple Jason Island and tagged Albatross, Black-browed albatross, Cormorant, Falkland Islands, Giant Petrel, Grand Jason Island, Malvinas, Penguins, Photography, Steeple Jason Island, Travel.